The VELAS series from GIGAA LASER offer you a multiple choice for your different clinic requirements. Surgical applications require a technology that offers equally effective ablation and coagulation options. The VELAS series will offer you the wavelength options of 810nm, 940nm, 980nm and 1470nm, so that you could choose a laser which suits your need best. The laser systems involve in Urology, EVLT, ENT, Dental, Gynecological, Orthopedic, Plastic surgery and other areas. Each year, we develop at least one new laser system, to bring the new technology and application, safety and health for the patients. Velas Laser System is newly developed diode laser for medical application specially designed for removing excess fat. We inset the probe, 600um of optic fiber that conducts the laser's energy by means of a very thin cannula of 1mm diameter and we sweep the whole area with the probe to dissolve the body fat. 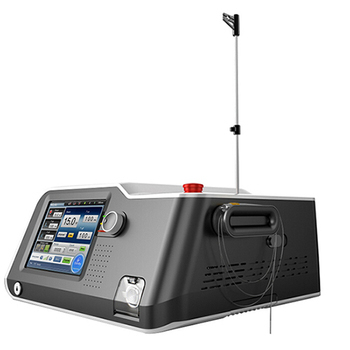 Multi-diode 1210nm Laser, optimal wavelength for the LIPOLYSIS. This greater specificity requires less laser power, which implies less heat diffusion in surrounding tissue and no undesirable side effects. Laser emission can be considered as minimal thermal.